Dr. Zeig is the architect of The Evolution of Psychotherapy Conferences, considered to be the most important conferences in the history of psychotherapy. 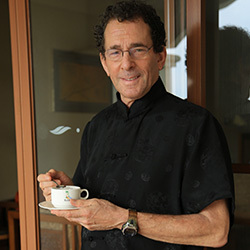 He organizes the Brief Therapy Conferences, the Couples Conferences, and the International Congresses on Ericksonian Approaches to Hypnosis and Psychotherapy, Dr. Zeig is on the Editorial Board of numerous journals and Fellow of the American Society of Clinical Hypnosis and the American Psychological Association (Division 29). A psychologist and marriage and family therapist, Dr. Zeig has a private practice, and conducts workshops internationally (40 countries). He has been an invited speaker at major universities and teaching hospitals including The Mayo Clinic, Menningers and MD Anderson. Dr. Zeig is president of Zeig, Tucker & Theisen behavioral sciences publishers and is on the Board of Directors of the Milton H. Erickson Foundation. He has edited/co-edited or authored/co-authored more than 20 books that appear in eleven languages. Dr. Landis: In 1980 the first International Congress on Ericksonian Approaches to Hypnosis and Psychotherapy was created by The Milton H. Erickson Foundation to honor Dr. Erickson. How did the Foundation come to sponsor the Evolution of Psychotherapy, a conference that spans the range of psychological perspectives? Dr. Zeig: Well, it was not Dr. Erickson’s goal or desire to establish a separate school of Ericksonian therapy. The Erickson Foundation has never been a membership organization and we do not certify people as Ericksonian psychotherapists or teachers of Ericksonian psychotherapy. So in keeping with Dr. Erickson’s tradition, a goal of the Foundation has been to insert Ericksonian thinking and philosophy into the mainstream of psychotherapy. And we do this by organizing multidiscipline conferences, such as the Evolution of Psychotherapy Conferences and the Brief Therapy Conferences. Also, our Couples Conference brings together experts from various disciplines of couples therapy. And so this has continued to be the guiding philosophy and goal of the Foundation – how can we create generative dialog across disciplines that provides cross-fertilization in noncompetitive ways? (L): Over the past years, there have been keynote speakers that we don’t necessarily associate with mental health issues or mental health professionals. Is this part of that cross-fertilization you’re talking about? (Z): Yes. Personally, I favor interdisciplinary dialog. If you want a field to grow, bringing in ideas from other disciplines is a very good idea. Remember that psychotherapy has grown enormously because of the influence of people who were not primarily psychotherapists. Take for example, Gregory Bateson, Jay Haley, and John Weakland. In the Evolution Conference, we bring speakers from outside of the field whose work has some way of enhancing our thinking and practice of psychotherapy. For example, at previous conferences we’ve had Betty Friedan, Gloria Steinem, Elliot Aronson, and Herbert Benson. At the upcoming conference we have Andrew Weil, Deepak Chopra and Philip Zimbardo. These are people who can speak cogently about health, about spirituality, and about social influence, and those are areas in which psychotherapists can definitely benefit. (L): The first conference was in 1985. I’ve noticed that the Evolution conferences themselves have evolved. How would you define that evolution? (Z): Originally the Evolution Conference was more academic. The first four conferences had written proceedings, and each of the faculty members presented an actual invited address in a forum that we called “Point Counterpoint.” And the first four Evolution Conferences proceedings were published, which are available either from Taylor & Francis or from the Erickson Foundation Press. Subsequently, we have made the Evolution Conference less academically formal and more interactive. We’ve increased the amount of interactive dialogs, the amount of interactive panels. The Evolution Conference has grown, and it’s taken on more of a modern form. In contemporary practice people are more interested in seeing cross-fertilization, and interdisciplinary dialog, and they’re more interested in practical ideas than academic argument. (L): The Evolution of Psychotherapy Conferences have kept up with the changes in the field of psychotherapy. How would you characterize that change? (Z): The field of psychotherapy has evolved greatly. The first Evolution Conference was scheduled in 1985 and that celebrated the 100th birthday of psychotherapy. Modern psychotherapy was invented in 1885 when Sigmund Freud first became interested in the psychological aspects of medicine. The fact that the Evolution Conference was scheduled to coincide with the 100th birthday of psychotherapy was purely serendipitous. Now, if you think about psychotherapy as it has evolved in the last 124 yrs, the first 60 yrs of psychotherapy was dominated by psychoanalysis. Then when World War II happened, Europe was rebuilding and psychotherapy moved to the United States. In order to develop psychotherapy you really need a culture that has a post-scarcity consciousness. When scarcity is prevalent in a society, there is no room or time for people to be thinking about their psyche. They’re too involved with survival. So when Europe was rebuilding, psychotherapy was developing in the United States. Subsequently two streams developed in juxtaposition to psychoanalysis, namely behavior therapy and the humanistic approach. And each generated offshoots. Then in the 1950’s there was the development of the systems approach. Family therapy and systemic thinking investigated how changing the context changes individuals. Subsequently, there was the cognitive behavioral revolution. I think that what Erickson heralded could be called an experiential revolution in psychotherapy that has spawned many separate schools. For example, strategic therapy, interactional psychotherapy, solution-focused therapy, the mind-body approach of Ernest Rossi, the self-relations approach of Steven Gilligan. So I think that Erickson heralded another major trend in psychotherapy. (L): From your perspective, how does this proliferation of schools of psychotherapy effect the actual practice of psychotherapy? (Z): In the infancy and the adolescence of a field, there is rapid and sometimes geometric proliferation. The field becomes divergent. I couldn’t even imagine how many schools of psychotherapy have existed since Freud started psychoanalysis. It would be in the 100’s if you counted all of the major and minor approaches to psychotherapy. Each of them is focused on a different unit of analysis and approach. The field of psychotherapy, when I first got into it, was dominated by leaders whose work could span a field. You could have an expert in family therapy who knew all the literature at that time about family therapy. You could have an expert on cognitive behavioral therapy who really knew all of the literature. You could have an expert on hypnosis who was really conversant with that field and knew all of the important details of that field. But psychotherapy has evolved. It has become more specialized and it’s impossible for me, for example, to stay completely abreast of all of the evolutions in the field of hypnosis. Experts have become increasingly specialized in smaller areas and they’ve taken on smaller chunks. There are experts on social phobia, and there are experts on obsessive-compulsive illness, and there are experts on trauma, because the literature in each of these subfields has gotten unwieldy. One way that psychotherapy has evolved is in the form of increasing specialization. The composition of the Evolution faculty has changed to represent the fact that there are less experts whose scope covers a single field and more experts who are specialized in specific areas. (L): How do you feel that the Evolution of Psychotherapy conferences itself is evolving in response to the changing field of psychotherapy? (Z): One of the purposes of the Evolution of Psychotherapy Conference is to promote more convergent rather than divergent thinking and to bring together people to talk about the commonalities that underlie successful clinical work. When we organized the first Evolution Conference many of the people who are on the faculty at that time hadn’t met. The first Evolution Conference was more like a version of Star Wars where wonderful experts would promote what made their approach unique. Subsequently, there has been much more interdisciplinary dialog and there’s been much more interest in establishing some conciliatory foundations rather than building fences. (L): I think that was very evident in the last Evolution when so many people who were presenting their own evolution showed how it did become much more convergent, how they were taking ideas from other people and had really expanded on those. As new ideas were presented to them they were able to see within their own discipline how that applied. You could see how the once sharp edges around the different disciplines started getting a little fuzzier. I though it was wonderful. (Z): Yes, really wonderful. I remember the first Evolution Conference because I had specifically invited people to talk about the unique aspect of their approach. For example, Murray Bowen would talk about his form of family therapy and R.D Laing would talk about his form existential therapy. But Salvador Minuchin at the first Evolution Conference in 1985 gave a presentation entitled, “My Many Voices.” And unique as Salvador Minuchin is, he talked about the people who spoke through him and informed his structural family therapy approach. He talked about how Jay Haley spoke through him, how Carl Whitaker spoke through him, even how Virginia Satir spoke through him, how Murray Bowen spoke through him, etc. Even in 1985 Sal Minuchin was talking about commonalities. Curiously, at the first Evolution Conference Carl Rogers talked about similarities and differences between his approach, the approach of Heinz Kohut and the approach of Milton Erickson. So even in 1985 there were people who were edging, if not jumping, into cross-disciplinary fertilization. (L): Your own evolution has been fascinating. I wonder if you could speak upon that starting from the time that you were introduced to Dr. Erickson. (Z): When I met Dr. Erickson I was 26 yrs old. It was 1973. He was very influential in a formative way at a time when I was open and impressionable. At that time I was steeped in Rogerian approaches and I had taken training in Transactional Analysis and group approaches to psychotherapy. I became fascinated with what Dr. Erickson was doing, which seemed to be light years different from any of the traditional approaches that I had learned or that I had been practicing. Over the course of more than six years I traveled intermittently to Phoenix to learn from him. In 1978, two years before Dr. Erickson, died I moved to Phoenix so that I would be closer to him. Over the time that I was with him, Dr. Erikson never – and I’ll underline that; it’s not hyperbole – he never taught me techniques. He never explained this is how you do hypnosis. He never explained to me this is how you use the interspersal technique, how you use the confusion technique. Mainly Dr. Erickson was in the people building business, and he would give me experiences that would help me to be a better Jeff Zeig. And those experiences could be hypnosis or tasks or metaphors or allusions and there could be poems, and directives. And this was a process helping me to evolve from the inside out rather than feeding me information didactically, which I could learn from a book. Erickson was the quintessential experiential psychotherapist. I was more of a left hemisphere person and I was more interested in categorizing and learning techniques. Then I started doing workshops and I was interested in teaching techniques. But gradually as I’ve matured, I’ve evolved myself into more of an experiential psychotherapist. And in the sense of looking for fertilization across disciplines, lately I have been studying Art, not just painting, but Art in all the various forms in which Art happens, including painting, poetry, drama, literature, choreography, and architecture, I am looking for codes that underlie the foundation of the experiential impact that is the foundation of Art. Art is not designed to provide information; Art is designed to have an experiential impact and there are codes in architecture that are very similar to codes in music composition because they’re both interested in having experiential impact. Experiential impact was essential to the work of Milton Erickson. He was an expert and had an experiential impact to help elicit effective “states.” So when Erickson was doing hypnosis that was about experiential impact to elicit states. When Erickson was doing psychotherapy, he was using experiential impact to elicit states. Even when Erickson was doing teaching he was using experiential impact to elicit states. Eliciting “states” was so curious to me. It was mind boggling to me because all of my years of schooling had been people giving me information, and none of my teachers had any notion about how to have experiential impact and elicit states. So, over the course of the last 36 yrs I have become increasingly interested in evolving myself so that I could be more experiential in my approach and that my approach would more resemble the approach of a dramatist than it would resemble the approach of somebody who was didactically teaching people and giving people information about what to do differently. More of my approach is how to help people to be different. So if anything I have tried to evolve myself into what I perceive as being the more pristine form of what Milton Erickson was about as a clinician. I primarily cast Milton Erickson not as the quintessential hypnotist –- which he was -– but I put him more as the quintessential experiential psychotherapist. Hypnosis was only one subcategory of how to use experiences artistically to elicit and evoke change. Jeff Zeig will be presenting in a number of sessions during the Brief Therapy Conference, including the Master Class in Hypnotic Psychotherapy Post Conference session on Monday, December 10th.